For fans of Buffy the Vampire Slayer , Queen of the Slayers just might be the answer to your questions regarding what happens after Sunnydale is demolished. 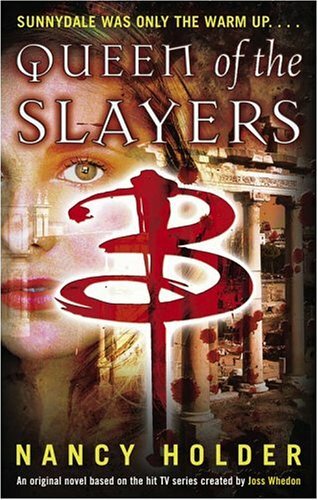 In fact, the book starts out just a few hours after Sunnydale becomes a hole in the ground while the survivors are on the school bus driving away, which is what makes Queen of the Slayers immensely exciting. Queen of the Slayers is really about the chain of events that occur after the destruction of the Hellmouth in Sunnydale . For one, Cleveland's Hellmouth still exists but the Scooby-gang is needed in England, where the Watcher's Council is being reconvened and even more Slayers are coming together. While Faith goes to Cleveland with a team of her own, Buffy has to stay in Europe and deal with evil forces as mass Slayers turn against her. Nancy Holder will have readers enthralled during the first few chapters as we eagerly cherish reading adventures about Buffy and gang that we haven't been privy to since the television series ended. Unfortunately, Queen of the Slayers is not as exciting and captivating as it first seems. Numerous events are strung together haphazardly and we are presented with mere events versus dialogues and emotions from the characters. The entire experience is detaching, and there are many major lulls with entire chapters devoted to the enemy's histories and schemes. Queen of the Slayers feels like it is written under a quick deadline, and in all honesty I wish I had never found out what happens after the Scooby-gang boards the school bus from Sunnydale . Following Queen of the Slayers , the lastly written book in "Buffy-verse" is entitled Dark Congress by Christopher Golden. Although I think Golden is talented, I am not interested in reading any more of Buffy sagas, and it is time I put the series to final rest.